For 67 teams, March Madness ends with a loss. Virginia Tech heartbreakingly joined those ranks on Friday night. The Hokies pushed Duke, the No. 1 overall seed, to the brink, but ultimately watched their hopes roll off the rim as the final horn sounded. The Blue Devil's once again escaped, and moved on the Elite 8 with a 75-73 win over the Hokies. 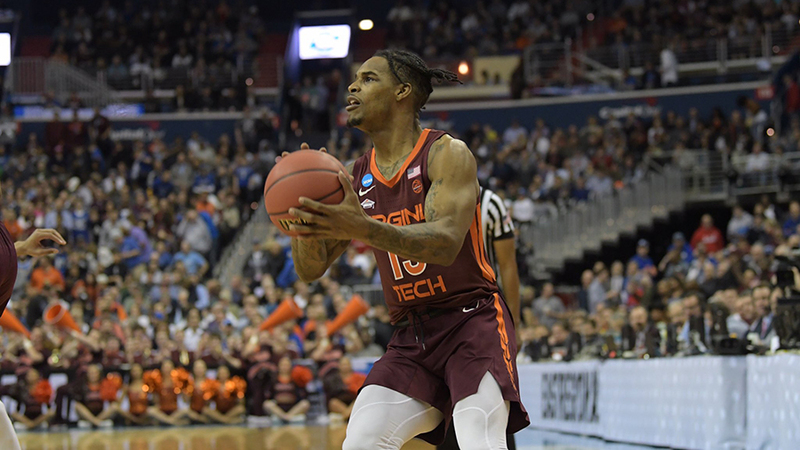 With the loss, the Hokies end their season in the Sweet 16 with a final record of 26-9. Ninety-nine out of 100 times, Tech takes that and runs with it. But somehow the Hokies managed to find the one way to make it hurt. While there should be plenty of celebrating a successful campaign, the cloud of "what if's" will hang over this game as well. Let's talk about the final two possessions. The Hokies, down two, had two chances in the final five seconds to tie or take the lead. Both play calls came out of a timeout. Both passes were made by Justin Robinson. Both were good looks. Both didn't drop. "The three was probably a bad pass by me," said Robinson. "The alley-oop at the end was a good look but it probably off-centered. So I think if I would have had a little bit more angle into their pocket, they would have made both." Humbleness aside, both opportunities were everything that Tech could ask for. Coming out of the first timeout, it seemed smart to go for the knockout punch in the form of a three pointer. At that juncture, Tech had expended a large amount of energy, after being down 8, to claw back within striking range. It's hard to imagine that a gassed Hokies squad would have been able to hang with the talented and red hot Duke team for an extra five minutes. Tech's second chance came with just over 1 second on the clock. At that point, the Hokies needed to take the best look they could get. Even if it was just a two pointer for the tie. And what a good look it was. "I would say the read on the play was if Ahmed [Hill] went to curl around for the lob, he's a tremendous 3-point shooter, you have to curl around and go the way that he went," explained Robinson. "The read was there. It was wonderfully drawn up. And I think we executed well, I just came up short." The emotion on Hill's face during the post game press conference was disheartening. Quite frankly, he looked like he had seen a ghost. It was hard to not sympathize for the only player on the team who has been in Blacksburg since Buzz Williams' arrival. "One of our coaches, Jamie [McNeilly], drew up a great play," explained Ahmed Hill. "It was a lob play that we ran kind of last year a lot. And this was our first time running it this year. I saw that they switched. I saw he was trailing. Justin threw a great pass and I just came up short. And that was about it. I wasn't worried about anything. I just tried to get my eyes locked on the rim and it just bounced to the left." And as that ball bounced to the left, Duke celebrated yet another close call going their way and danced on to the Elite 8. Pinpointing The Problem:The first 20 minutes was Virginia Tech basketball at its finest. The Hokies came out hot (7 for 17 from deep in the first half), punched back whenever Duke took a swing (led at every media timeout of the first frame), and never backed down (had a 4-point advantage heading into the break). But after halftime, it turned into a Blue Devil showcase. The freshman trio of Tre Jones, RJ Barrett, and Zion Williamson scored 37 of Duke's 41 second-half points. Of the 29 shots taken after the break by Duke, 24 of them came courtesy of the youngsters. The Blue Devils knew what would be successful and they stuck to it. The Hokies, on the other hand, didn't stick to what worked. Tech shot 17 three's in the first half but only hoisted up 9 after the break. The Hokies went away from what has them surgining to a lead throughout the first 20 minutes. Crisp ball movement leading to wide open looks for elite shooters. The passing game in the second half felt forced and, at points, too fancy. After starting fast in the first half, Tech started the second frame 0 for 8. That cold stretch allowed the Blue Devils to get hot and take control of the contest. Are You Surprised? Jones entered the game making 23% of his shots from beyond the arc. Against the Hokies, he drained 5 of 7 attempts from deep. For anyone who doesn't want to do the math, that's 71%. And yet, the anomaly doesn't feel like one. Part of it just seems like another cruel installment of opponents catching fire against Virginia Tech. But another part of it needs to be credited to Jones and his support staff. "These guys believed in me all year, especially after last game with me struggling from three," said Jones. "They kept believing in me. Coach kept telling me to take the shots and these guys kept telling me take my shots, and they were able to fall tonight." Just looking at the box score should make everyone do a double take, just because of Jones' performance compared to expectations. But in reality, it's what great teams do. They take what's given to them (opponents sagging way off Jones) and make it work. Duke did so against Tech by having confidence in their freshman. Disappointing/killer part of second half that led to Duke biggest lead - Horne hoisted two of those nine threes. NAW and KBJ had some careless turnovers. We also settled for long pull up twos. all that, and not to mention the officiating was in Duke's favor. Zion was allowed to bull thru people to go to the rim, and Barrett was allowed to shoot after the whistle (not in the act of shooting) for a 3 pt play. When Coach K and instruct the refs or how to call the game, we're in trouble. We fought hard and showed we were a force. IDK... I thought that was about one of the most well balanced officiated VT - Duke game I've ever seen. I certainly think you are correct about Zion, but that has been true all year and against every team. I'm not sure that was special to our matchup. We missed several point-blank shots in the second half. Make any 2 of them, and it's a different result. Overall, that theme of us running our offense crisply in the first half, then not as crisp, leading to forced shots, in the second half, has been pretty prominent over the last few years, but maybe not as much this year. I don't know if it's fatigue, but I think it might also depend on the sense of urgency we have at halftime, and what needs to happen in the second half for us to win. And yeah, we did miss too many point-blank shots, even in the first half. KBJ had a hard time 'breaking the ice' just to buy a layup on several occasions. But that stuff happens on a given night, regardless of how good you are, so you just have to be persistent and give max effort to follow up on the shots, which I think we did pretty well based on our rebounding totals. Anyone else pissed that we let #20 playbthe bulk of the second half with foul trouble and didn't take it to him every play? We challenged him once when he had 4 fouls and it was a no call and it's like we decided we didn't want to ruin his night by forcing him to foul out. One of the keys of the game, and the entire tournament really, for me was seeing KBJ sink into his old self offensively. He was somewhat effective, he made a few good plays, and we certainly benefited greatly from his presence on the floor. But since the return of #5, he hasn't been nearly as assertive as he was in that 8 game ACC stretch. There certainly could have been something schematically going on that I didn't see. It probably had more to do with the offense almost exclusively going through him when Robinson was out. He ended up being that one that picked up most of Robinson's points and assists. Once Robinson was back, we sped up play and ran it through him more. The anomaly feels like an anomaly to me. Jones hadn't made multiple 3's in a game since November. He had 5 total made 3's in the past 6 games. Against UCF he didn't have a hand in his face, or really a defender within 10 feet of him and he went 1-8 from 3. We guarded him exactly how we should have. Going into the game I think everybody was ok with losing if it came in the form of the 328th ranked 3-point shooting team having a hot night vs. letting them beat us inside. If Jones doesn't lose his mind and make those shots we win that game. He raised his 3P% 4 points off that night alone.